Setting up quickly, the sun was moving up under the moon then the sight became dramatically different with the diamond ring, Baily's beads, the faint corona, and some prominences. After several minutes I realized that I had been looking at this only through the cameras, pushing the shutter which shook my video take, guessing film exposure settings, trying to keep the telephoto view on center and not looking directly with my own eyes! It all happened so quickly. Looking around, I was expecting night, but it was more like dusk or twilight. We saw about 4 minutes of totality where we were (see video). Later we found out that the thousands of people who had camped on the center line location were overcast with heavy clouds for the whole 7 minutes of totality. People at the top of Kilauea volcano, with the least probability of a clear sky that day, got a great view. So now we have another opportunity to see this amazing event, but for an even shorter time. Because the path of totality crosses right through the lower 48 states, large numbers of people from around the country are expected to try to see it. If you don't get into the 50+ mile wide path of totality, you will not experience the real exciting part of the eclipse at all, and it will be very brief along the edge of that path. Californians, Washingtonians and Canadians will probably drive to Oregon in huge numbers to get a glimpse of this spectacle. Some predict millions of visitors to Oregon. There are not that many roads that cross the path of totality, so traffic could be jammed up in spectacular ways, with so many trying to get to a good spot in the last minute. There are several Woodstock-like events scheduled and we can look back to what kind of mess traffic was like for that. Most hotels near the centerline have been sold out for months and years. Will this discourage the hordes from trying to see totality? What will the weather predictions be? Will there be massive wild fires obscuring the view? Will service stations run out of gasoline? Will people remember to bring solar glasses (to use during non-totality), rural road maps, emergency food, water and toilet paper? Or, will people stay home and just watch it on TV? 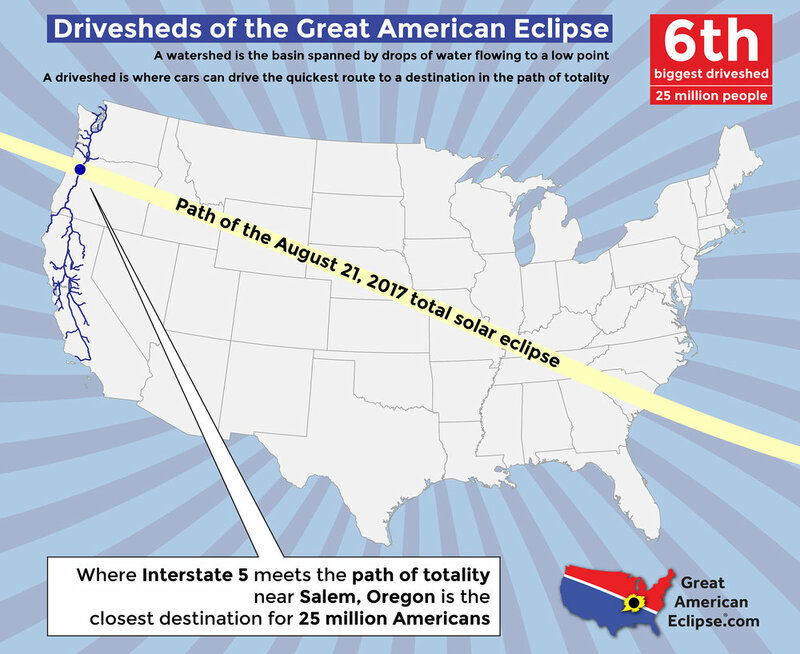 The www.greatamericaneclipse.com web site has a lot of useful information to help you prepare for this celestial event. 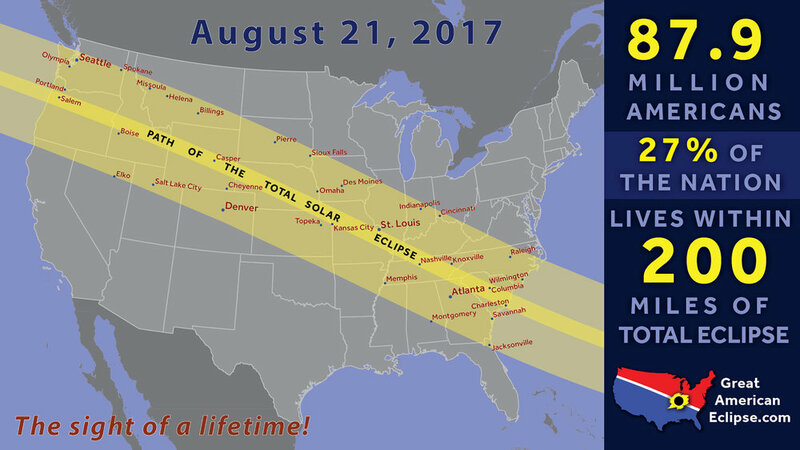 Don't just expect to get up on the morning of August 21st and drive down south of Newburg and casually watch a total eclipse of the sun. You might even want to forget about trying to manage taking fancy photos unless you can totally automate the process. There will be plenty of people doing that. Make a plan that considers your tolerance for the risks. The motions of planets and moons along with their eclipses are quite predictable, but the practical aspects of observing them are not. Be prepared!